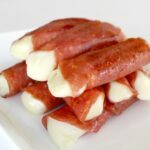 These low carb salami and mozzarella snacks are fried to make the salami crispy and the mozzarella melt-in-the-mouth. 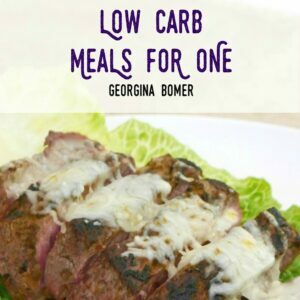 If you ever get the craving for something greasy, for something that is no good for you whatsoever – I totally recommend that you try this recipe. At 0.5g net carbs per stick, you can even treat yourself to a few! 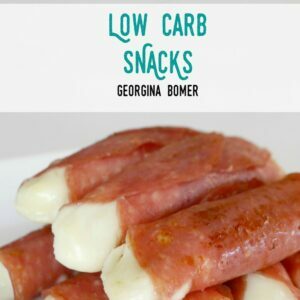 The idea for this came from a very common low carb snack idea of wrapping salami or ham around a cheese stick. Then of course you have the ooey gooey mozzarella sticks, but they come coated in breadcrumbs, and therefore, carbs. As far as I could tell, no-one has tried cooking the salami and cheese once they were combined. At first I tried baking them, but the cheese melted way before the salami got warm, never mind crispy. So frying was the way to go. 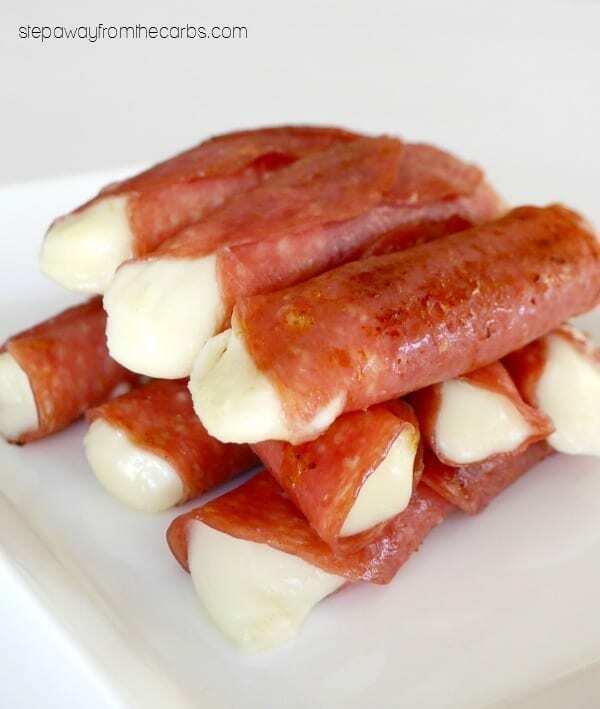 Take two slices of salami, overlapping slightly, and wrap them around a mozzarella cheese string. It takes just a few seconds to prepare each one. Warm a non-stick skillet over a medium-high heat (actually I used a grill pan, because the ridges kept the sticks in place); no oil is needed. Place each wrapped stick into the skillet seam-side-down. They need barely a minute on each side before the salami starts to get crispy. Remove from the pan before the cheese threatens to melt right out of the salami, and drain on paper towels. 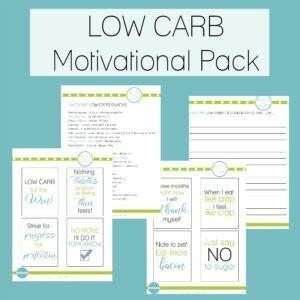 This stage is important, because otherwise these low carb snacks will just be WAY too greasy. Place on a serving plate and serve warm, although you’ll still need to provide napkins for these moreish snacks! Take two slices of salami, overlapping slightly, and wrap them around a mozzarella cheese string. Warm a non-stick skillet over a medium-high heat; no oil is needed. Place each wrapped stick into the skillet seam-side-down. They need barely a minute on each side before the salami starts to get crispy. Remove from the pan and drain on paper towels. 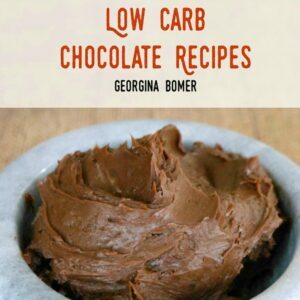 Place on a serving plate and serve warm. 0.5g net carbs per serving of two salami slices and one cheese string.